A mere 40 minute drive from Cape Town, the Cape Winelands are without doubt one of the most beautiful regions in the world. Leave the coast line of Cape Town and wander towards the culinary capital of South Africa – Franschhoek. Cross rugged mountains passes and descend into century old vineyards framed by high arching mountains. Drive lightly down age-old cobbled driveways and gently make your way into the Cape Dutch style manor houses. A mere 40 minute drive from Cape Town, the Cape Winelands are without doubt one of the most beautiful regions in the world. Leave the coast line of Cape Town and wander towards the culinary capital of South Africa – Franschhoek. Cross rugged mountain passes and descend into century old vineyards framed by high arching mountains. Drive lightly down age-old cobbled driveways and gently make your way into the Cape Dutch style manor houses. The Cape Winelands epitomises luxury and relaxation. Although the area is steeped in tradition it is also a vibrant hub for fine wining and dining. Whether you are looking to simply slow down and take in the countryside ambiance, or perhaps a cultural journey visiting galleries, historical monuments and time-honoured wine estates. The Cape Winelands has endless experiences on offer. Although there are over 20 wine-growing regions within the Western Cape region, the term “Cape Winelands” is most often synonymous with the three most popular towns: Franschhoek, Stellenbosch and Paarl. Each quant town has its own undeniable character but maintain a common theme – being set amongst rolling vineyards and breath-taking views. Take a stroll down the oak-lined lanes of the University town of Stellenbosch; visit the local art galleries and charming coffee shops, before heading through to experience the French heritage and delectable restaurants of Franschhoek. In keeping with the indulgent nature of the area, Iconic Africa have selected three of our most luxurious and much-loved hotels, namely La Residence, Le Quartier Francais and Delaire Graff. Year on year these hotels grab international awards, La Residence most recently voted No 1 Hotel in the World – Conde Nast Traveller Readers’ Choice Awards. A handful of the Cape Winelands highlights can be experienced on our day tours but with so much to on offer in the region and with wine-tasting being such an integral part of the Cape culture, an extended visit to the region is highly recommended. Opulent, yet down to earth, hotels make the Cape Winelands an ideal choice for those seeking a romantic break; however, the region also opens itself up to families. Family friendly accommodation and outdoor activities allow a perfect family retreat. Many wine estates offer large rolling lawns which deliver the ultimate setting for the entire family or your better half to enjoy a Winelands picnic! Savour the exquisite wines, food and cheeses in the picture-perfect Cape Winelands setting. If you are unable to take the time out and spend a couple nights in the Winelands than speak to one of our travel experts about our tailored day tours. The Winelands is best enjoyed when you are actively able to partake in the wine tasting and learn about the local vintages, safe in the knowledge that your tour guide will drive you home safely. Our Cape Winelands packages will give you a great starting point off which to start fashioning your visit to the Winelands. If you not sure where to start, simply contact one of our expert consultants and let us tailor-make your Winelands excursion to fit your preferences and budget. The Cape Winelands is arguably Africa’s most majestic region. 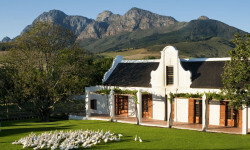 No trip is complete without a winelands visit and ideally should be combined with other wonderful African destinations. Simply contact one of our African travel experts and let us tailor make your journey to this and other majestic African destinations! Set in the heart of South Africa’s culinary capital, premier wine region and arguably the most breathtaking valley in the country is the epitome of a 5 star country guesthouse. Leeu House is a traditional Cape Dutch masterpiece complete with world-class cuisine, award-winning artwork and 12 deluxe rooms it’s everything you could want in the perfect country getaway.